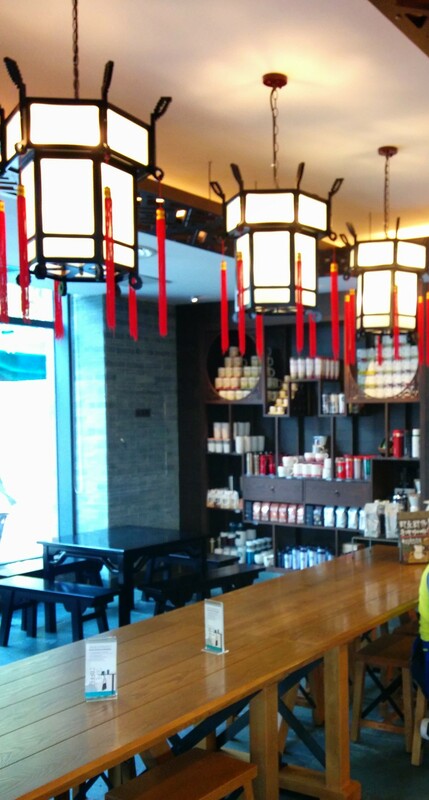 This was not the first time we’d heard the Minge Hu Starbucks was special, and we decided to check out this claim for ourselves the next time we were in Nanning. 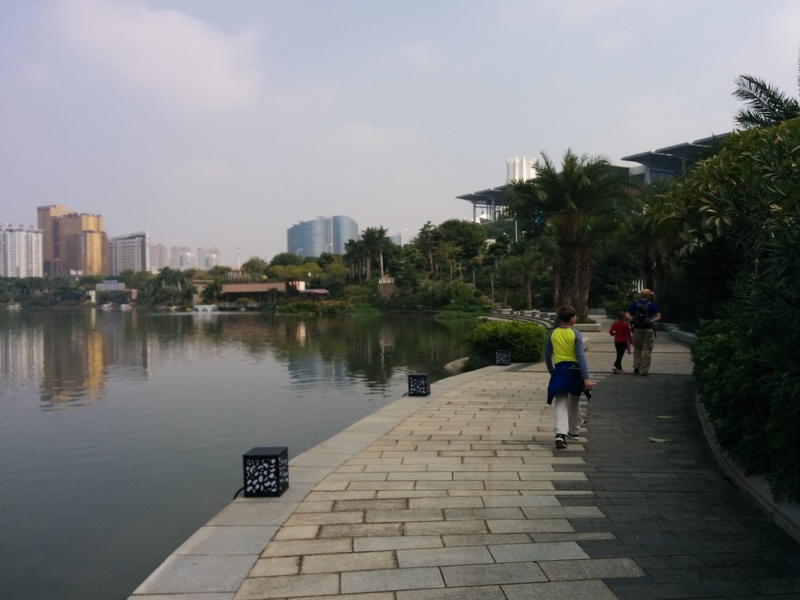 Strolling along Minge Hu (民歌湖 Folksong Lake) in Nanning. Minge Hu is translated as Folk Song Lake on English signs, though it seems like all the foreigners I know just call it Minge Hu. 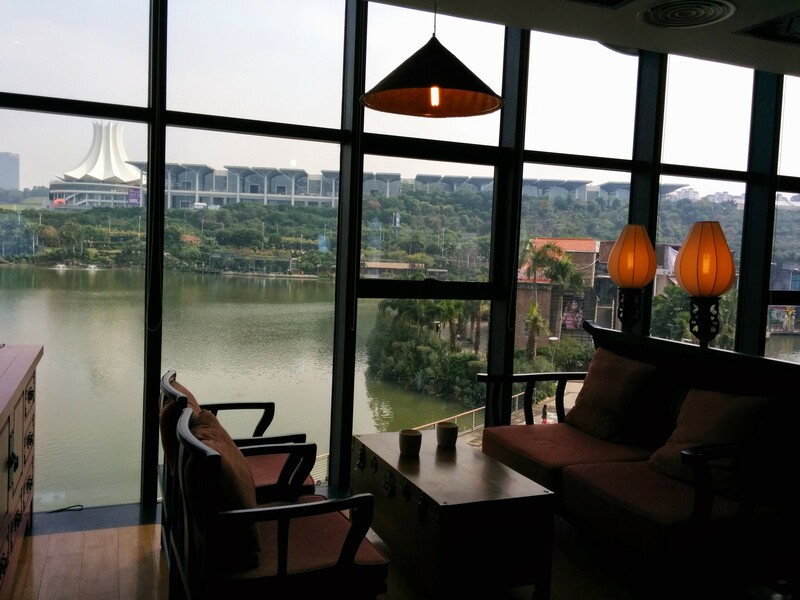 It is in the “new city” area of Nanning, Guangxi, where everything seems to have been tapped with the China-ASEAN magic wand and abracadabra’d into something bright and shiny. Minge Hu was included in the magic transformation. Being right next to the Expo Center meant it was selected by the fairy godmother to go from plain ol’ river with a dull outdoor amphitheater to fancy-schmancy scenic site a few years ago. This Cinderella now has beautifully landscaped walking paths around it, and boats to take you on tours. The restaurants and bars in this area are all high-end, so it’s no surprise that they would put in a Starbucks here. But even a normal, run-of-the-mill ‘Bucks would have fit in nicely. Would they really pour serious money into constructing the world’s most beautiful one here? The outside is very nice, certainly grander than the average Starbucks. It comes complete with a couple waiguoren sitting at the tables by the entrance. Nice touch. 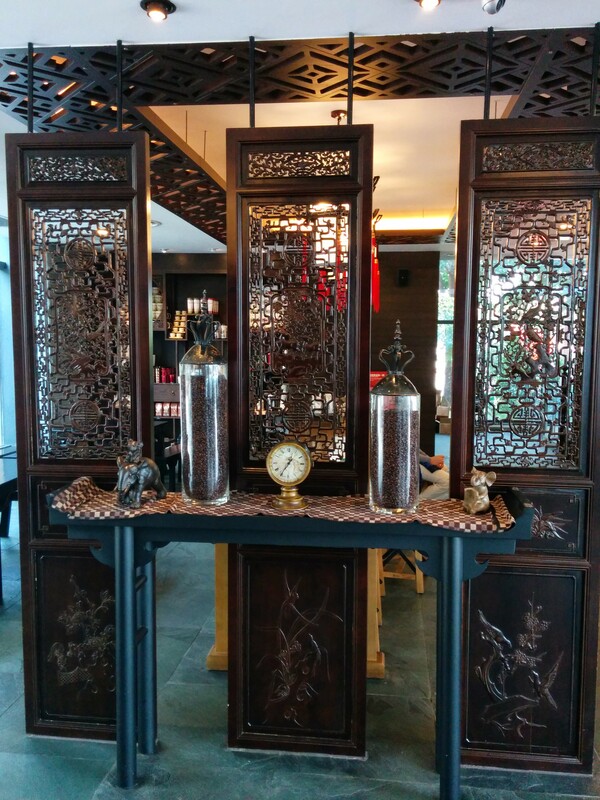 …and here’s the tables behind those carved wooden screens, just next to the counter where you place your order. Whoa. Carved wood, recessed lighting, gudai Chinese lanterns, and slate flooring? Not bad so far. Also in the front area is this posh seating arrangement. I’m already wondering if they’d be interested in redecorating my apartment in Jingxi. That was just the downstairs, folks. 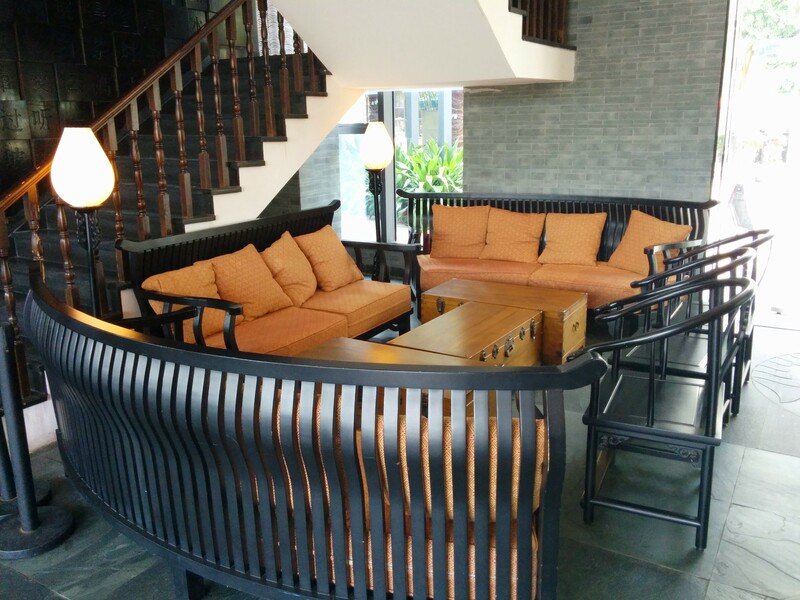 Upstairs, the swank continues with more carved wooden accents, beautiful furniture, and tasteful red accents. Did you notice I used the word “tasteful” just then? I think I’m getting a little dizzy. I’m still not used to finding this level of stuff here in little ol’ Guangxi. 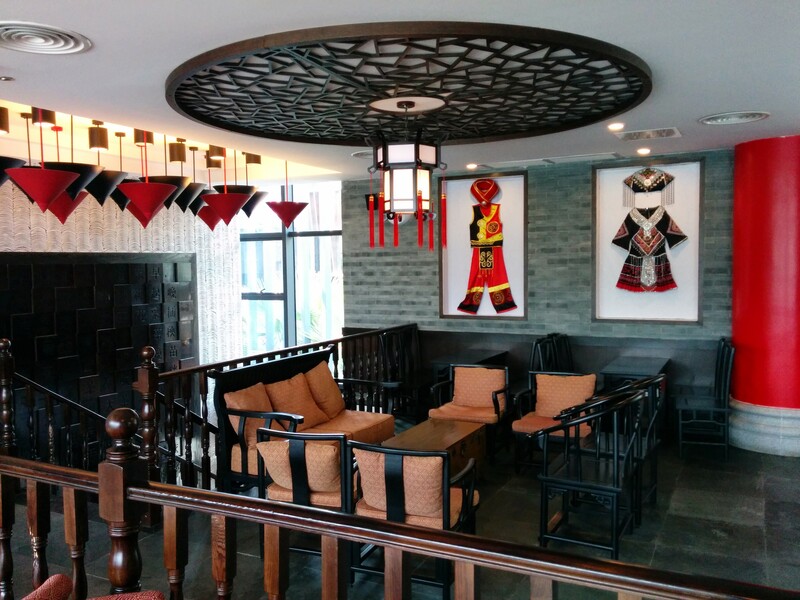 A pair of traditional Zhuang costumes hang on one wall. My kids comment that the boy’s hat looks like it’s been hung upside down. I think they’re right, but still. This is already nicer than any Starbucks I’ve been to in the States. The staircase is dominated by this gorgeous wood carving. The carved characters are the lyrics to a song called 三月鹧鹄满山游 from the movie 刘三姐 Liu San Jie (Third Sister Liu), which tells the story of a Zhuang folk hero who battles the evil overlords with her powers of song. It’s got to be THE most famous movie about Guangxi ever. Kudos to whoever decided on this brilliant cultural nod. The song is about picking tea. Starbucks has tea, too, you know. The upstairs is not only nicely decorated, it also overlooks Minge Hu. 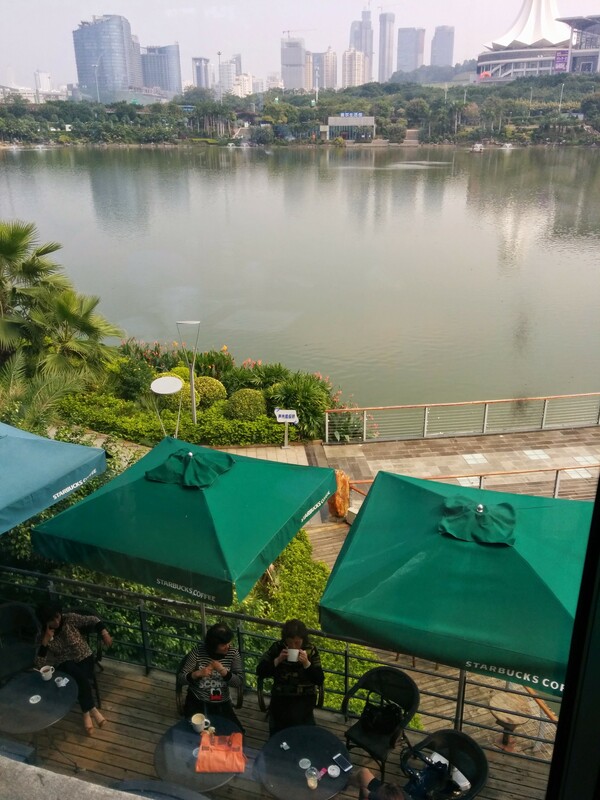 Now, this lake is not necessarily the most scenic, but you’ll recall this isn’t “Step inside the Starbucks overlooking the most beautiful lake in the world,” so I think we’re okay. You can see the China-ASEAN Expo Center just across the lake – look for the “white lotus building,” as our family calls it. In good weather (or in hot weather if you’re a mad dog or Englishman), you can sit at outside tables. Now, for all you laowai out there, there’s a highly important question burning at the back of your mind, one I have not addressed yet. The answer to your question is: There are two one-holers, and neither of them are squatties. I didn’t get a photo of the thrones, but I did get a shot of the special instructions about not squatting (two verbs, in fact, for clarity: 站/蹲) on the matong. 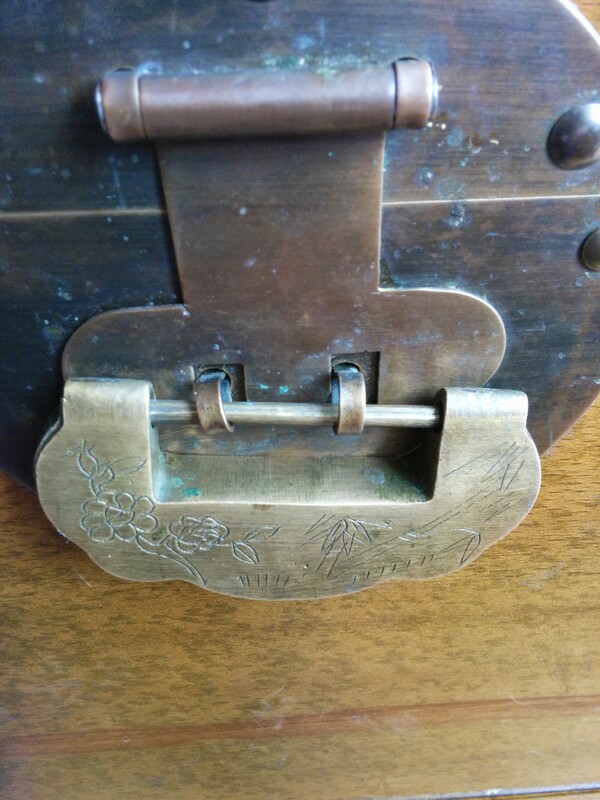 I was also pretty impressed by the nice details, like this carving on the latch of the trunk that served as our table. For the sake of my argument, please either ignore the oxidation, or decide that it adds character. Yes, I know it’s not really an antique, and it was probably mass-produced in some factory in Guangdong, but (spoiler alert) Disneyland isn’t real either. 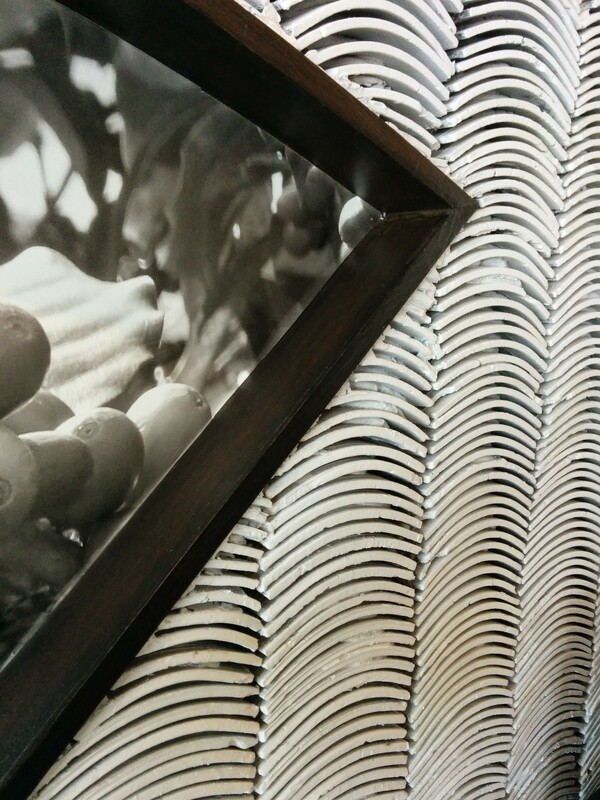 This wall had some typical Starbucks photo art mixed in with Chinese photos, all of them framed in a very Chinese way. The wall itself is made of stacks of Chinese roof tiles, painted white. When you’re used to whitewashing and concrete, this is incredible. So, yes, overall, we were pretty darn impressed. I’m going to have to agree with my friend’s sister. By the authority vested in me by no one at all, I declare this to be The Most Beautiful Starbucks in the World. Love it! 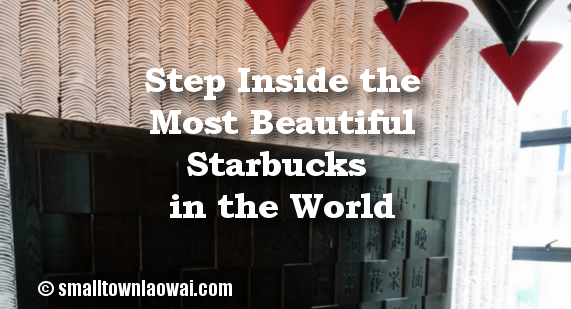 What details of the most beautiful Starbucks in the world. I believe you and you don’t have to travel to 20 more countries to prove it. Thank you, Danielle! Glad you enjoyed the virtual tour. It makes that over priced cup of coffee worth it!